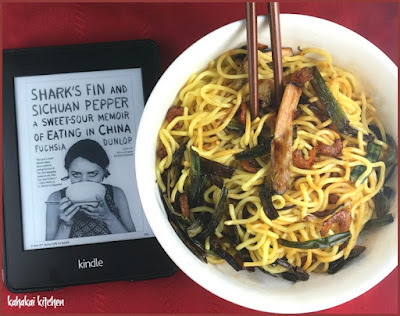 It's time to roundup the delectable array of dishes inspired by our April/May Cook the Books selection, Shark's Fin and Sichuan Pepper: A Sweet-Sour Memoir of Eating in China by Fuchsia Dunlop. Although the majority of our participants were not fans of the book--mostly due to the amount of Dunlop's rather graphic descriptions of the unappetizing things she ate--it still managed to inspire them in the kitchen, so let's take a look. Camilla of Culinary Adventures with Camilla did enjoy the book saying, "This memoir was immediately captivating, lagged about towards the latter parts, but wrapped up nicely. I will definitely seek out more of her books and thank you, Deb, for the introduction to this author." Camilla made Hui Guo Rou (Twiced-Cooked Pork Belly) and said, "The name hui guo rou literally means ‘back-in-the-pot’ meat, because the pork belly is first boiled, then stir-fried. Dunlop tries from her first Sichuanese shi fu (cooking master), Feng Rui. Note that you need to let the pork belly cool completely before slicing. I did the first part one evening and the second part - and serving - on the second evening. ... This attempt at cooking pork belly was definitely a hit with my family. Not a single piece was left. Success." It was lovely to have Alicia of Foodycat back with us for this round. She was interested in reading the details of Dunlop's career but said, "I found it very hard to deal with the things she found herself eating. The almost blasé approach to animal cruelty and eating endangered species (although she did say she may end up vegetarian and gives quite an interesting explanation for the animal cruelty) was a kind of cultural relativism that didn't sit well with me." 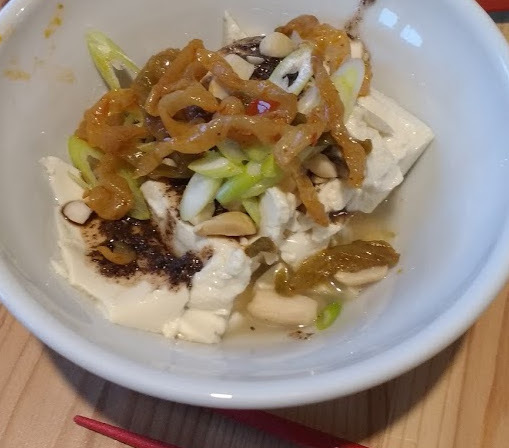 Alicia found her inspiration in a meat-free dish saying, "As it happens, the dish I personally most associate with Chengdu, the capital of Sichuan is 成都豆腐花 - Chengdu street tofu with soy chilli, peanuts and preserved vegetables as served at A Wong. Which is vegan." 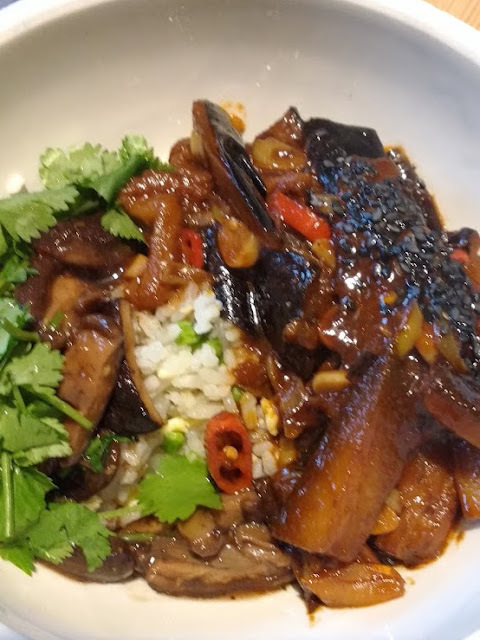 And Alicia added a second dish, saying "The fish-fragrant aubergine that initially captured Fuchsia's imagination can also be vegan if you use vegetable stock, so I made that as our main course (following Diana Henry's recipe for Fragrant Sichuan Aubergine in Simple), along with some marinated mushrooms (which I reheated to serve). And then I let the vegan side down by serving it on egg fried rice. But it was delicious. And no endangered species died." "The traditional diet of the Chinese masses could be a model for the entire human race. It's the way the older generation, the poor and the wise still eat: steamed rice or boiled noodles, served with plenty of seasonal vegetables, cooked simply: bean curd in many forms; very few sweetmeats; and small amounts of meat and fish that bring flavour and nourishment"
So with those words in mind I am sharing a quick, easy and flavorful stir fry. I hope that you enjoy it. Rant over....."
Co-host Simona of briciole was not drawn to the book and said, "I had heard praise for our club's selection and was therefore eager to read it: I cannot say it captured my attention with either writing style or content. Still, I am grateful to the book for making me try a new ingredient, a great spice that will keep its place in my cabinet and that I am looking forward to using in numerous other dishes." Simona found her inspiration in the Sichuan Pepper, using it to make a (Mild) Chili Oil, saying "The recipe that mostly inspired me blends chili oil and a vinegar and soy sauce mix to make a vinaigrette: I left the two separate so I can apportion each depending on the vegetable I am dressing: for example, a bit more vinegar on farm-fresh butter lettuce, less on roasted asparagus." Co-host Claudia of Honey From Rock said she "thoroughly enjoyed" the book finding, "Dunlop writes a mostly delicious, sometimes revolting, entertaining, well researched and fascinating account of the food, culture and the peoples of that humongous country, mixed in with just enough history to punctuate her tale." 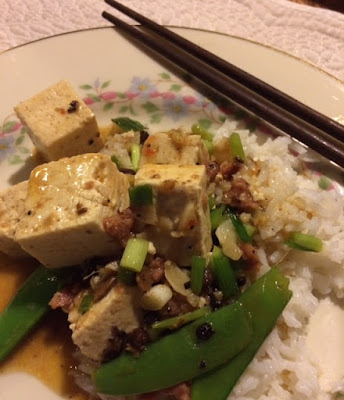 Claudia chose to make a classic Chinese dish, saying "In one little eatery Fuchsia demonstrated her method of making Mapo Tofu to get the chef's approval. Now that is a dish I do love, and I wanted to try an authentic Sichuan version. Thus my recipe choice for this round of Cook the Books. The name translates from the Chinese to Pock-Marked Mother Chen's Bean Curd, and according to Fuchsia's remarks in her cookbook, Land of Plenty, the recipe "is named after the smallpox-scarred wife of a Quing Dynasty restaurateur, who delighted passing laborers with her hearty braised tofu. It's one of the most famous Sichuan dishes and epitomizes Sichuan's culinary culture, with its fiery peasant cooking,"
Cathy of Delaware Girl Eats enjoyed the recipes in the book, saying, "My main interest was the book’s recipes, enlivened by her descriptions of eating those dishes. But while I consider myself an omnivore, the telling of consuming all manner of insects, rodents and other “delicacies” was a little beyond my appetite." 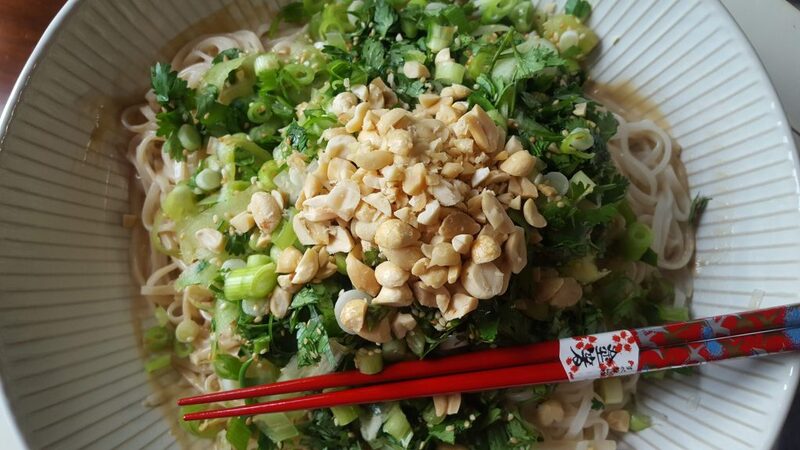 For her recipe pick she said, "...I was drawn from the first to the description of DanDan Noodles, which at one time were the archetypal Sichuan street snack. Named for the bamboo shoulder pole carried by street vendors, they are incendiary hot. Dunlop says that they look quite plain, being just a small bowl of noodles topped with sauced minced beef. She goes on “But as soon as you stirred them with the chopsticks, you awakened the flavors in the slick of spicy seasonings that coated each strand with a mix of soy sauce, chili oil, sesame paste and Sichuan pepper. The effect of this was electrifying. Within seconds, your mouth was on fire, your lips quivering under the onslaught of the pepper and your whole body radiant with heat to the point where on a warm day you might even break out into a sweat.” I found them the same – spicy hot yet sweet and tangy. Dan Dan noodles are addictive, a fast and fresh introduction to Sichuan cooking since the amount of heat can be tailored to the eater’s tolerance." Co-host Debra of Eliot's Eats had mixed feelings about the book and found it repetitive, saying, "I started out enjoying Dunlop’s memoir, even if parts were a bit redundant and lagged. I enjoyed her discussion of the Sichuan area of China and the regional differences that abound. Hats off to Dunlop for her total immersion into the culture. I couldn’t have done it. And, I found the bulk of the book just more of the same—weird eats. Dunlop (ad nasuem) describes (over and over again) eating odd and disgusting (at least to this Westerner) stuff." Debra reached for the Sichuan pepper too, making Sichuan Cucumber and Noodle Salad and saying, "I have experimented a bit with Sichuan peppercorns and I like the overall punch of acid of this unique spice. Although my Sichuan pepper went into the making of hot chili oil, I adapted a salad recipe to highlight the spice." Amy of Amy's Cooking Adventures recommends skipping around to the good parts only, saying, "By the end, I was skimming to get through it. The book should have ended 4 chapters earlier. The book became depressing and boring as the author felt the need to wax on about endangered species, pollution, and climate change. While all of these topics are real issues in modern day China, the way in which they were presented was pretentious and boring." 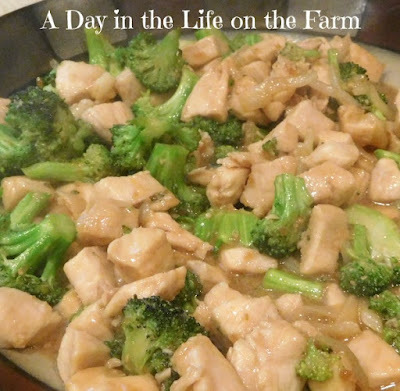 It did inspire her to go in a different cultural direction for her recipe, "I wasn’t making offal (*hurk*) or pretty much any of the recipes included in the text – they were either vile or included such difficult to obtain ingredients (remember I’m in the sparsely populated great plains region) that I couldn’t do it. I thought of just making a stir fry. But since all of my stir fries are basically the same teriyaki-ish base it felt like a cop out. However, I kept going back to the end of the book – the depressing bit. After becoming disenchanted with China, Dunlop goes to the Xinjiang region and is revitalized. I was surprised to see Nan listed as a very popular bread in this area. I had to look at a map to see exactly the blending of cultures that must have brought nan to China – and ultimately that it what I decided to make." As for me, I liked the book. As a non-meat and poultry eater, there were definitely some sections that were against my basic values and had me squeezing my eyes shut or on the verge of queasy, but I found Dunlop's experiences and her insights into China very interesting. I could relate to her try-anything-put-in-front-of-you mantra having worked a lot in Asia and instructed by my boss to do the same--although I certainly did not have to eat nearly the depth of non-appetizing dishes and ingredients that Dunlop did. Because I procrastinated in coming up with a dish to make and did not get to Chinatown to source ingredients, I found myself drawn to one of the simpler recipes in one of Dunlop's cookbooks, making Shanghai Noodles with Dried Shrimp and Spring Onion Oil. This was my first time cooking with dried shrimps and while the texture wasn't a winner, the flavor of the noodles and the spring onion oil was. 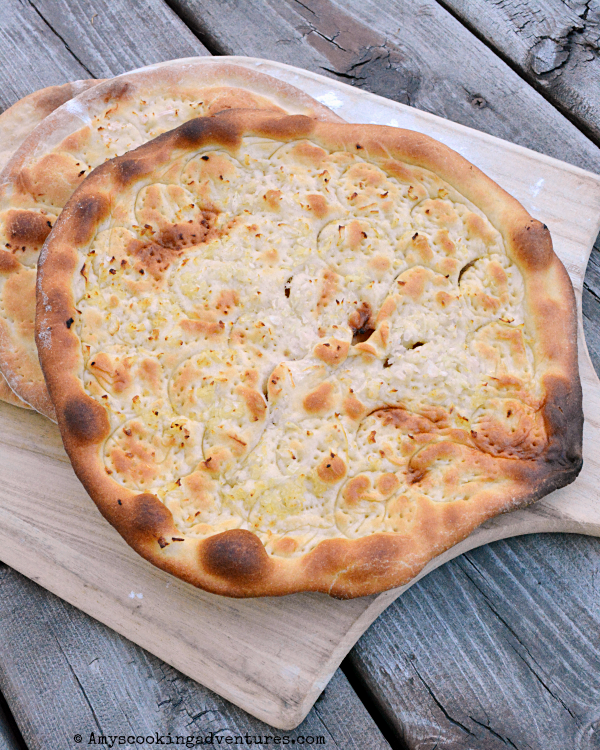 I think the recipe may become a staple in my house! Mahalo to everyone who joined in! I triple-checked the comments and my email and I believe I have all of the entries, but if somehow I missed anyone, please let me know. 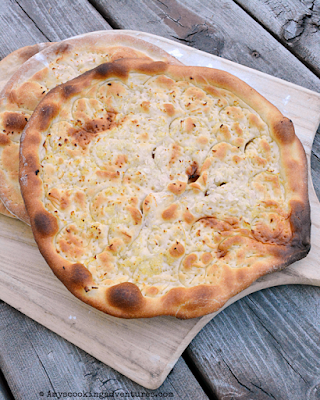 And now I'll turn things over to Claudia of Honey From Rock for our June/July pick Garlic and Sapphires by Ruth Reichl. Aloha and happy reading and cooking! Great round-up Deb, and selection too. I like getting into new territory, with places and food. I haven't use dried shrimps either but I like the idea of the noodle dishes that were shared by you and others. Now that I'm over my outrage with Dunlop I am going to try some of the noodle recipes shared. Thanks for the round-up! Reichl is going to be an excellent palate cleanser!